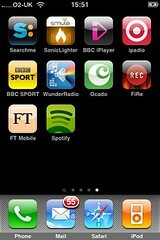 I was greeted this morning with the news that the Spotify iPhone application was available to download. I didn't hesitate for a moment as the Internets have really got behind this one with the amount of hype being generated. I registered and downloaded the desktop client as well so that I would get the full experience and the ability to sync playlists. Had I known that the desktop client had Last.fm integration, providing the ability to scrobble tracks, I would have definitely installed earlier. Disappointed to learn that the Spotify iPhone app doesn't have Last.fm scrobbling enabled but I presume that will be made available in future releases. I wasn't able to experience what the iPhone app had to offer as it requires a Premium subscription to even progress passed the login screen. First impressions with the Spotify service are very good though and it's highly likely that I will subscribe when I have created several playlists and familiarised with the functionality. The Next Web provide a detailed analysis of what the application offers, limitations and are considering moving overseas to gain access to the iPhone app as it's not available there. Many had expected the Spotify application to be rejected by Apple, due to the service providing similar features to iTunes. With Apple's iPod event Wednesday, I'm interested to see if we'll see Apple unveil any significant developments to the iTunes service. Personally I would like to see iTunes become more social, with Spotify being labelled as an iTunes killer will Apple respond accordingly?! Looking forward to finding out what's on the agenda..